You just filled a thrift store with bags of donations and you still cannot seem to cram that last pair of pants onto your rod without breaking a sweat. You have colour coordinated everything yet you still cannot find what you are looking for. Your closet looks more like the racks at Winners than the organized space you dream of. Finding and making use of space in your closet can be frustrating but it is not impossible. With these tips, you will no longer have to fear where your beautiful new outfit will reside or if you will ever see it again once it passes the closet door. Most wardrobes are dominated by pants, shirts and blouses, skirts and sweaters and not so many gowns and overcoats. This high volume can fill up a single rod very quickly leaving you to think creatively on where you are going to sneak that last pair of trousers. There is an easy remedy without adding multiple pairs to one hanger. By adding a second rod underneath, you will be able to stack your shorter items, maximizing storage and preventing squishing and wrinkling of your clothing while utilizing dead wall space. When organized properly, shelves can fit more than 5 folded sweaters without chaos ensuing whenever you decide to pull one out to wear. By adding shelf dividers, multiple piles of clothing can be created on a single shelf without fear of one toppling onto the other. All of your smaller items such as belts, scarves, and hats can be stored in baskets or boxes acting as additional drawers to maximize the use of your shelf space. Take advantage of empty wall space by adding hooks. 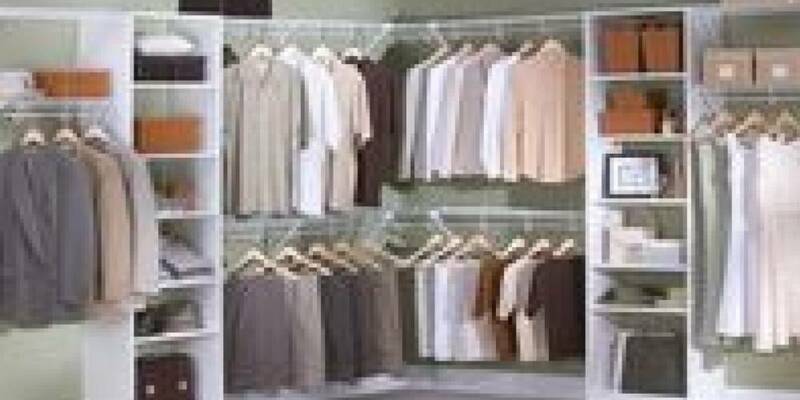 They are versatile and can store almost everything from jackets and purses to jewelry and belts. A few essential pairs of shoes can quickly swallow up your floor space. Instead, add shoe racks. Not only will this make it easier to store and find the shoes that you need, it is easier to vacuum without having to reorganize every pair after a simple clean up. Your suitcases don’t have to swallow up your space without serving a purpose. Try storing your out of season clothing inside them. This will free up some closet space while finding another use for your luggage. Like these ideas but don’t know how to make them possible? Come visit our showroom and we will be happy to help you choose an option that works for your space.